Today is our last day off. We have four working days this week, then we pull out on Saturday to begin our 1100 mile trip to Texas. Friday night will probably be a restless night knowing we leave on Saturday. SIGH! Taking care of business today – we took Patches (our Calico) for her annual vet visit. We felt it would be easier to do that now rather than wait until we got to Texas. Dr. Vet said she was in fine physical shape. We should have her blood work results by Wednesday. Cody and Qianna had their annual checkup a month ago. Since today is our last day off, we opted to take a trip to the Scarecrow Stomp in Dahlonega, GA. This festival is kinda like a kick-off for the fall festivals in North Georgia. As we drove the 58 miles to Dahlonega, we passed Burt’s Farm and caught a quick glimpse of a sea of orange better know as a pumpkin patch. It was our intention to stop there on the way back but that did not happen because I took a scenic route back from Dahlonega. (meaning I missed a turn). So tomorrow, Cody and I will drive back to Burt’s Farm for a photo of the sea of orange while Carol and the other fur babies stay home to rest. In Dahlonega, we drove right to the town square and parked just about in the same slot when were there a few weeks ago. Cody and Qianna went with us so they could take a stroll around the square and enjoy the scarecrows also. Not all scarecrows are meant to scare. In fact, based on the scarecrows we saw, they were quiet charming. We photographed about 35 of the 60+ scarecrows that are located all through town. Folks can vote on their favorite scarecrows. The scarecrows will be auctioned off on Saturday. We hope you enjoy our sample of scarecrows. On the way back, we stopped in Ellijay to have a second helping of ribs from Shane’s Rib Shack. If there is a Shane’s Rib Shack in your neighborhood and you have not checked them out yet, you are missing a treat. Seriously, this place has the best ribs outside of Texas. After returning to our RV, we settled in for the evening. It did not take long before the rain started. No wind – just rain. 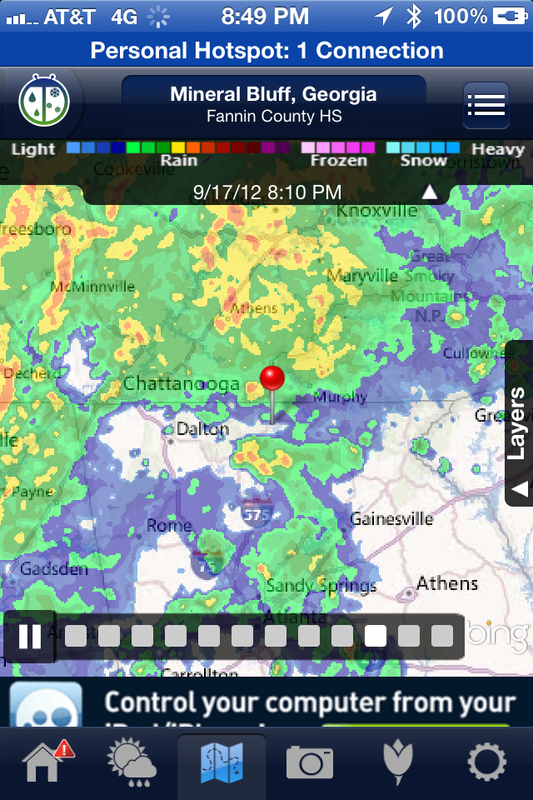 Depending on how wet the pastures are, we may not get a chance to scoop in the morning. Oh darn! That’s about it for our exciting day. We have four days to rearrange the basement and pack our stuff away. Friday, Carol and I took a trip to Misty Mountain Model Railroad in Blairsville, GA. At 3,400 square feet, this is the largest O-gauge model train display in America. It includes over a mile of track, 12 bridges, 4 trestles and 15 tunnels. The display is based on the Blue Ridge Mountains. 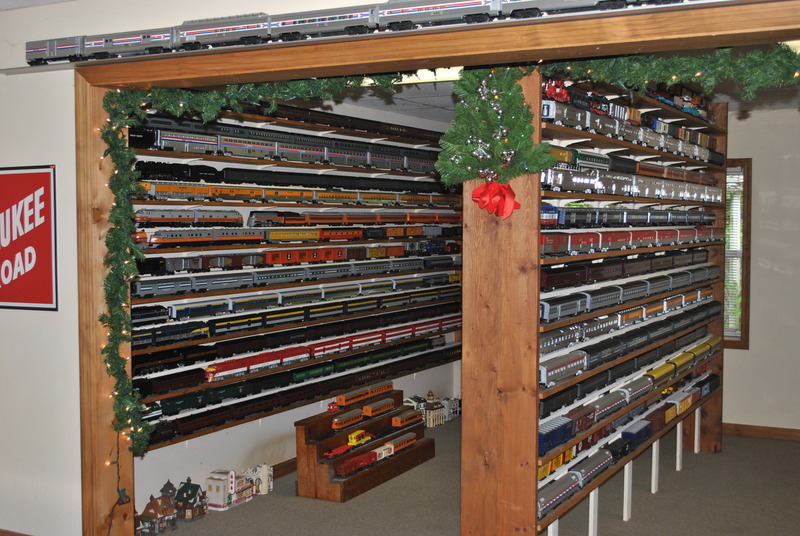 It took Charles Griffin and two companions over 11 years to design and build this display. Here is Carol with George. He greets folks as they arrive for the tour. 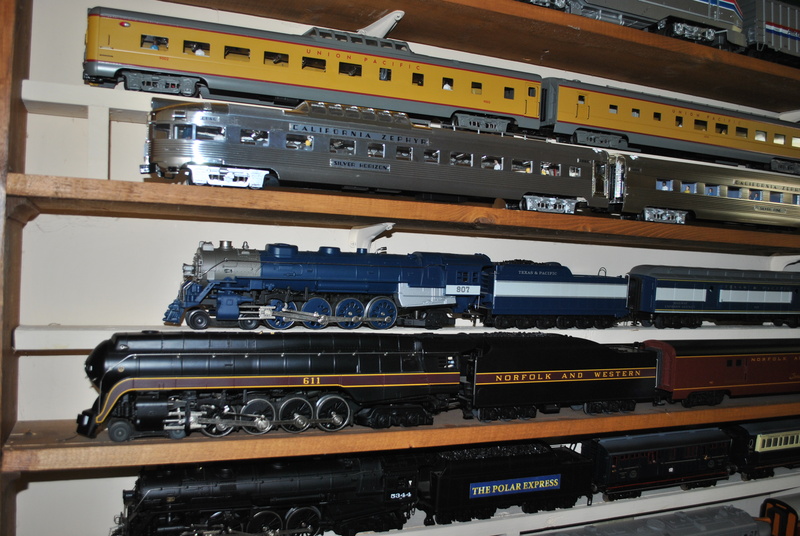 First stop is the train set collection located in the basement of museum. Words cannot describe this collection. 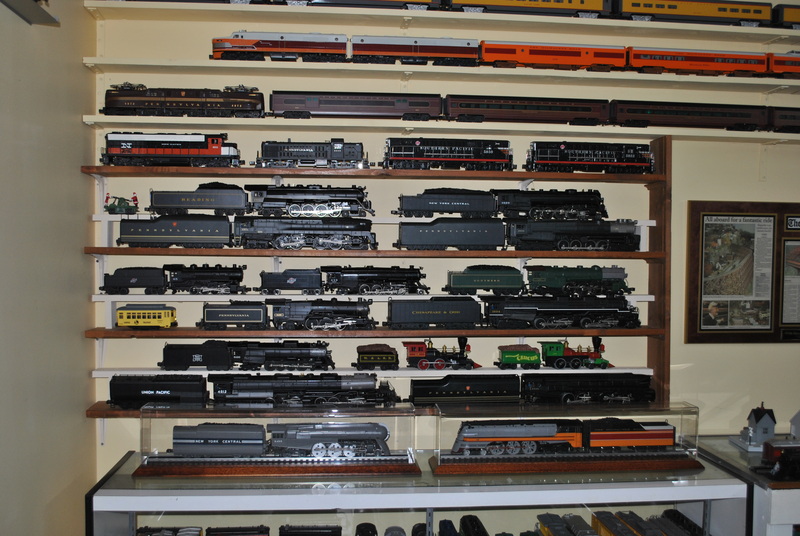 The collection includes over 300 complete Lionel train sets plus several rare antique engines. The display shelves and rooms are immaculately clean. After watching a short segment of a DVD that was produced by the Atlanta PBS TV station, we were escorted back upstairs to enter the display. No single photo can capture the magnitude of this enormous display. 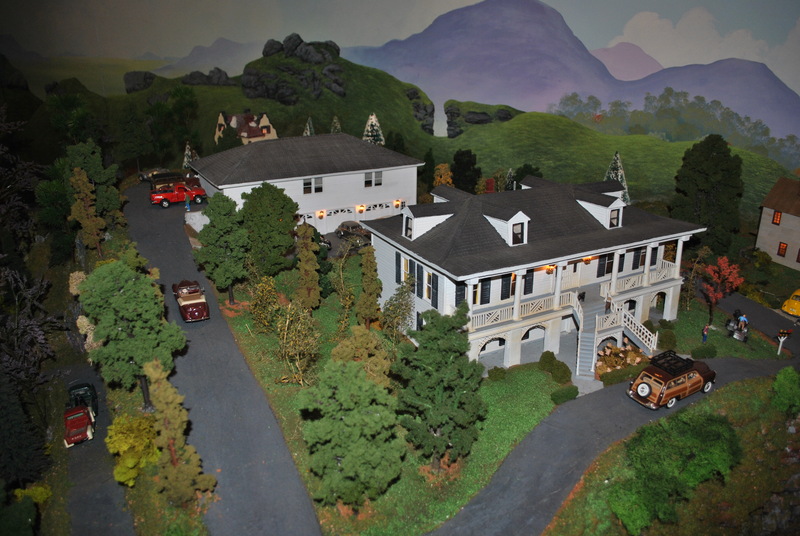 The display set included a model of George’s house and museum. This is an amazing place. All proceeds are given to local charities. If you come visit this area, you must see this collection. For more photos of the museum and display, click the link at the beginning of this post. Today we have one more trip to take. September and October are the prime times in the area for local festivals. We are headed back to Dahlonega for their annual Scarecrow Stomp. You will have to check back tomorrow for the photos. We have had a very busy week. Moving hay was a priority. I kept up my strategy of moving 10 bales daily. Thursday I volunteered to help a neighbor move furniture from their living room into their basement. Friday we found out hay delivery was scheduled for today. So, Friday became crunch time. This hay had to get moved in two days. 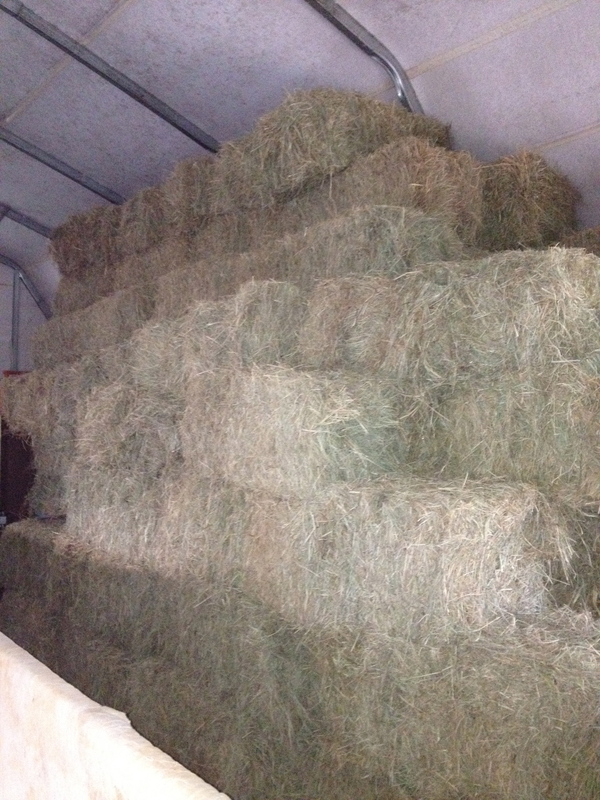 PS – you’re looking at 54 bales. At 5 bales per load with Chuck Wagon, that would take 11 round trips. Time to get creative. Just how many bales can Chuck Wagon carry? Would you believe 8! Somewhere on the other side of the hay in the passenger seat is me – the driver. On Friday, Pam and I managed to get 44 bales moved. That would leave me with 10 more bales on Saturday. After all the hay got moved, the boys barn now looks like the photo on the left, barn 1 looks like the photo on the right. 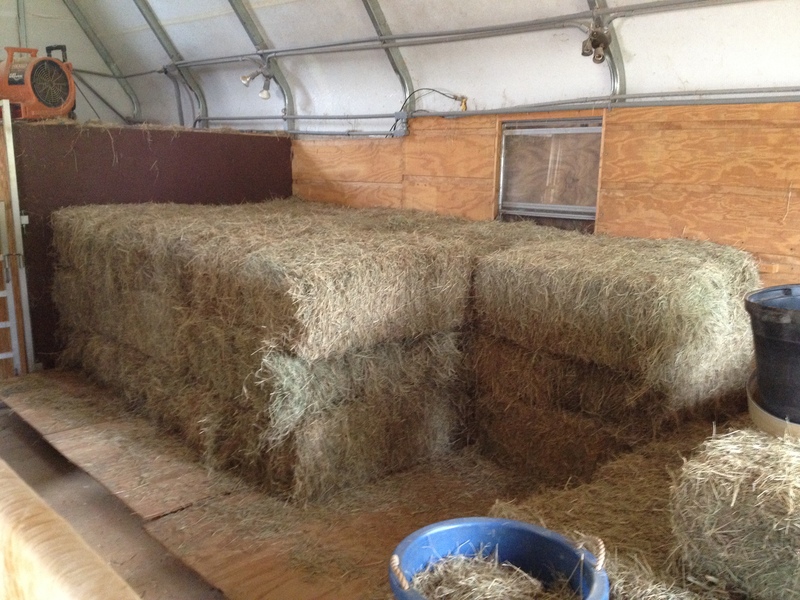 Pam cleaned barn 1 and prepped it for Sunday’s hay delivery. This morning I built one more 4×8 pallet, then found out the hay was not coming today because it was raining at the farm where hay was is coming from. Can’t haul hay when it is raining. Barn 1 is ready for the hay whenever it gets delivered. Meanwhile, today we had company. On September 8th, I received a private message from a follower from Chattanooga, TN. She wanted to know if she and her husband could come out to visit us. It took a few emails and schedule adjustments. They were coming today – the day we were expected to receive hay. 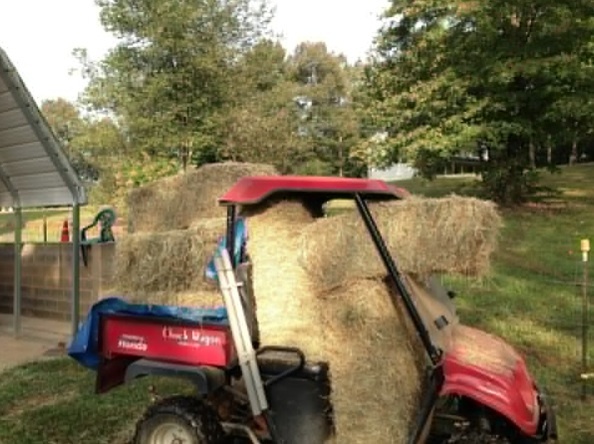 Pam excused me from helping stack the new hay since I worked at clearing Barn 1 of the Summer hay. Bob and Carol Higginbotham programmed their GPS and headed our way. About 1PM, Carol called to say, they could not find us. Their GPS got them close. By the time we figured out where they where, we lost phone contact with them. They managed to get back to the main highway and stopped at a gas station. When they called again, we said we would come get them. We had an enjoyable visit with them. 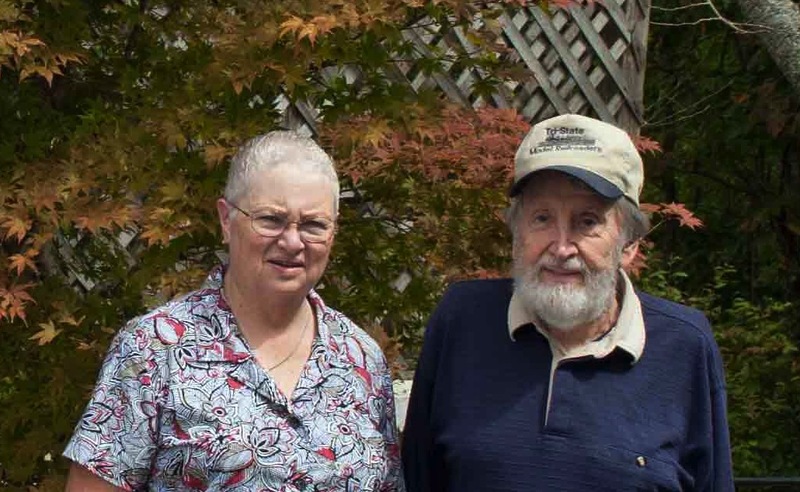 We shared our story of how we became full-time RVers. Then exchanged workamping experiences. 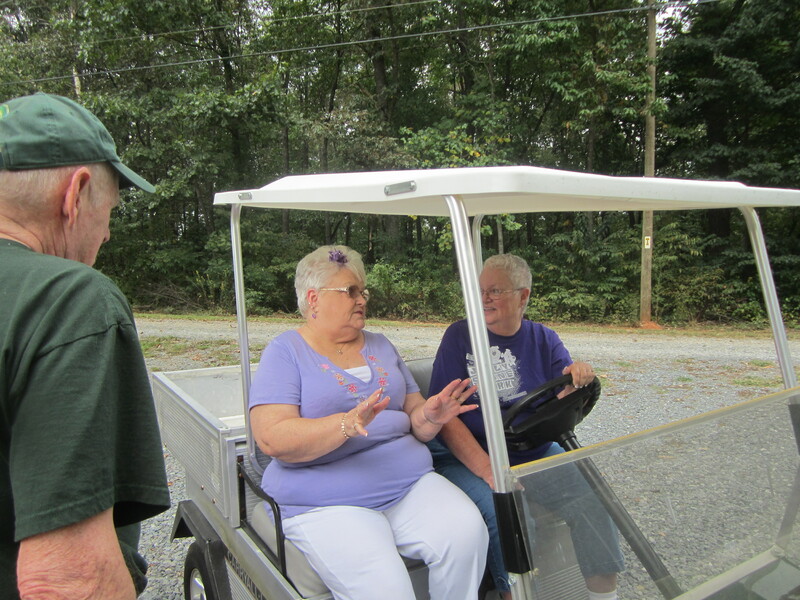 My Carol stepped out to get the Hay Wagon to give Bob’s Carol a lift to barn 2 where the girls were. Carol and Bob had a chance to mingle with the girls while Carol and I told them about our llama duties. The girls behaved pretty well except they had to demonstrate their expertise in producing poo. We decided it was time to leave the girls. 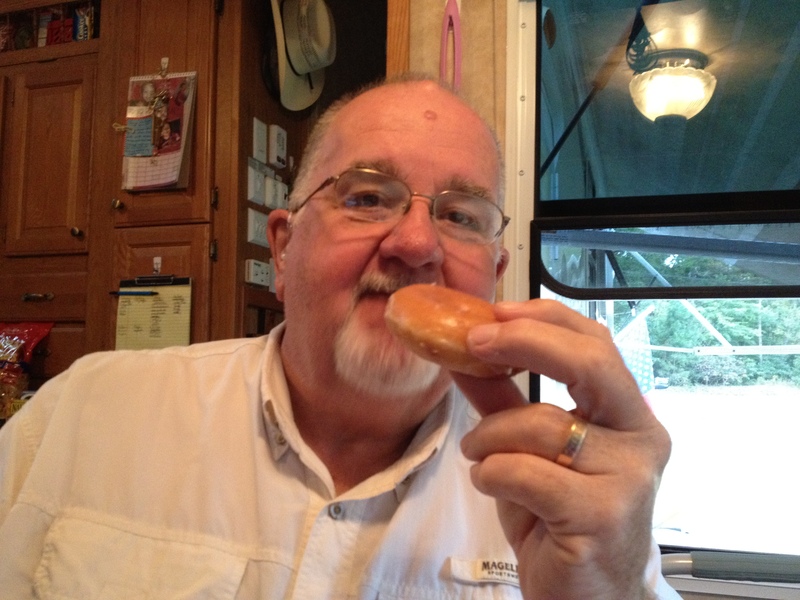 When we got back to the RV, Bob stepped back to their vehicle and delivered a treat for us to enjoy later. This may seem like an odd treat. When Carol suggested bringing us some Krispy Kreme doughnuts, I explained to her how cool that would be because I had a routine of taking my grandson Gage for doughnuts once a week when we lived in Corpus Christi. So the doughnuts where indeed a special treat. We decided it was time for a late lunch/early supper. 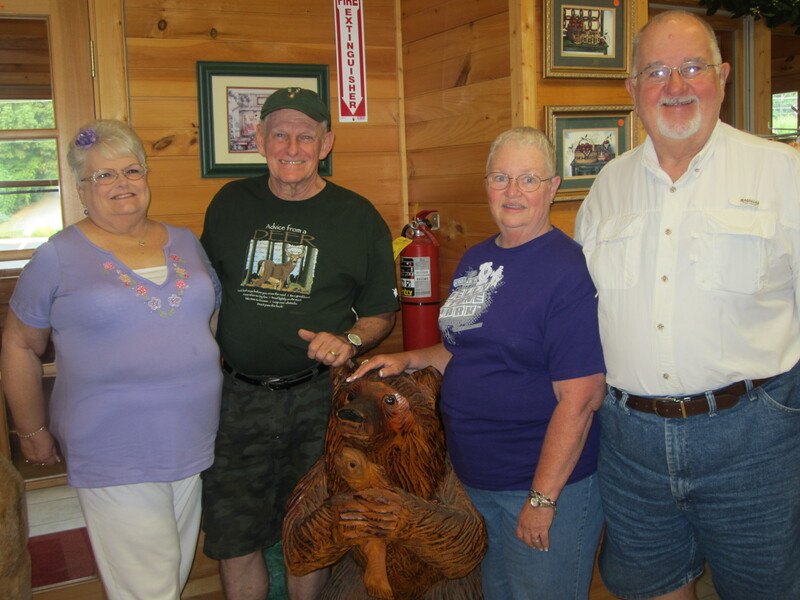 Carol and Bob followed us to Pat’s Kountry Kitchen in McCaysville. After a yummy meal and more conversation, it was time to say, “See ya later.” Here we are leaving Pat’s. That’s it for tonight. Tomorrow I will tell you about our trip to the Misty Mountain Model Railroad. 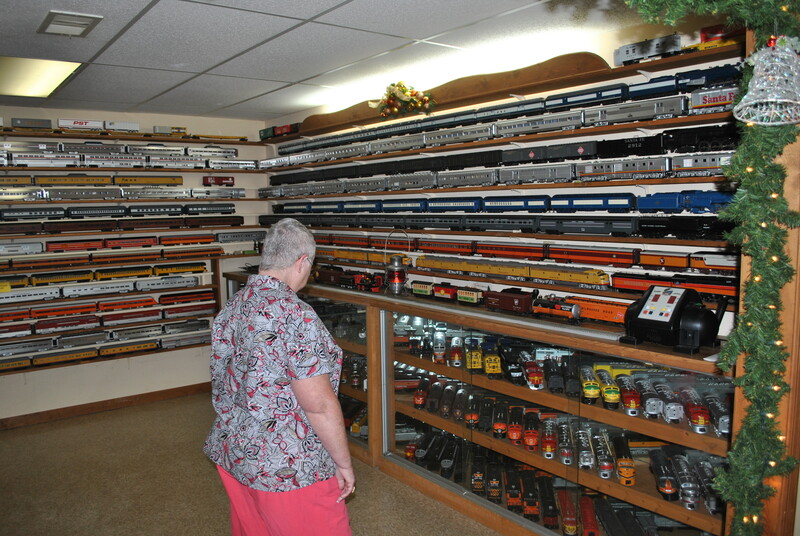 You will want to come back to see the photos from the largest private collection of Lionel trains in the country. Thanks for stopping by, y’all comeback now. No need for alarm. 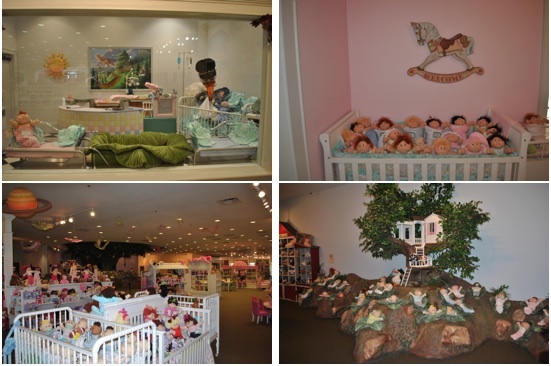 Babyland General Hospital is not a pediatric hospital. It is not even a people hospital. 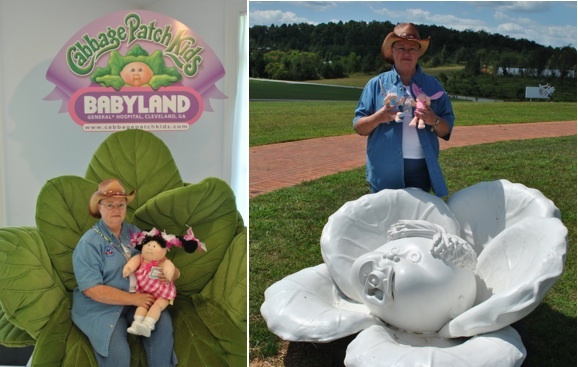 Babyland General is the showplace and birthplace for Cabbage Patch Kids located in Cleveland, Georgia. 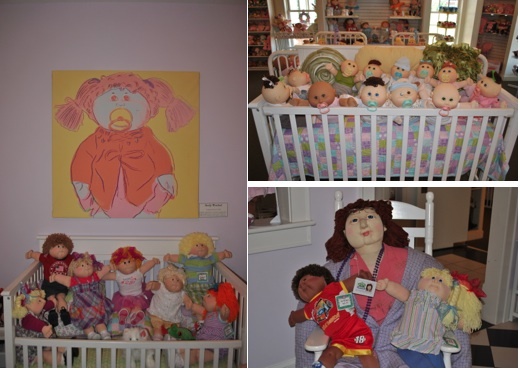 This is an amazing place, especially if you have a kind heart towards Cabbage Patch Kid dolls. Carol learned how to make these adorable dolls back in the 80’s. 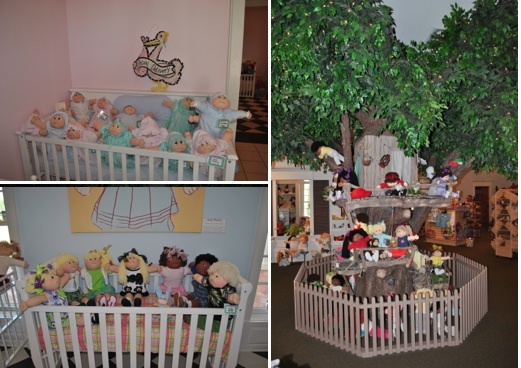 As we walked through the maze of dolls, we were astounded at intricate detail that was put into make this place. Truly amazing. Here are a few photos from our visit today. Daycare Nurse – bottom right. As tempting as it was to adopt a new Cabbage kid or two, we just let it go. Where would we put them in our RV? The Bunny Bees will be a good reminder of our visit to this area. 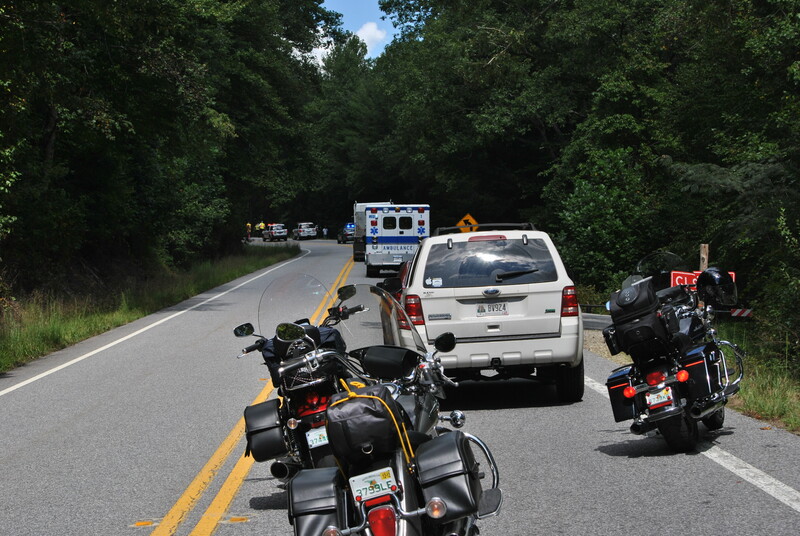 As we headed back on Highway 129, it did not take long for us to encounter this. This did not look good. Traffic can easily come to a quick stop on twisty two lane highways running through the mountains. It did not take long before the view behind us looked like this. We discovered a vehicle had drifted to the right edge of the highway and lost control. 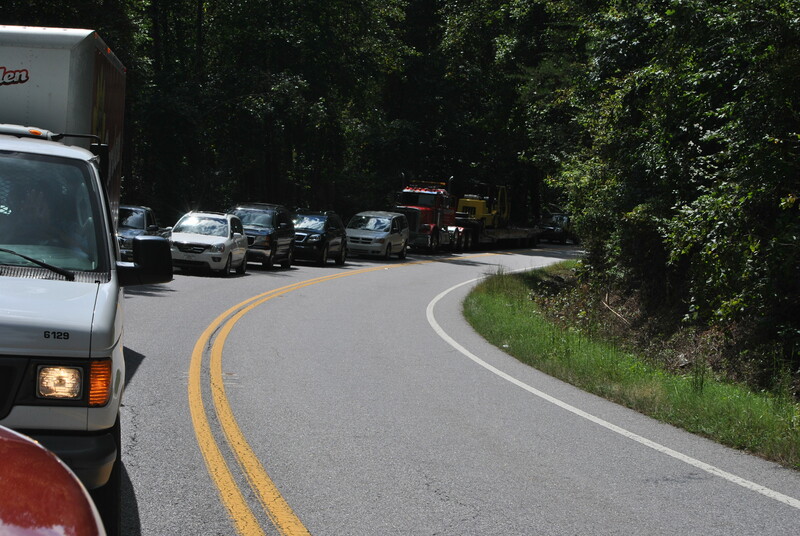 Fortunately, a tree stopped the vehicles forward motion and two other trees stopped the vehicle’s lateral motion. 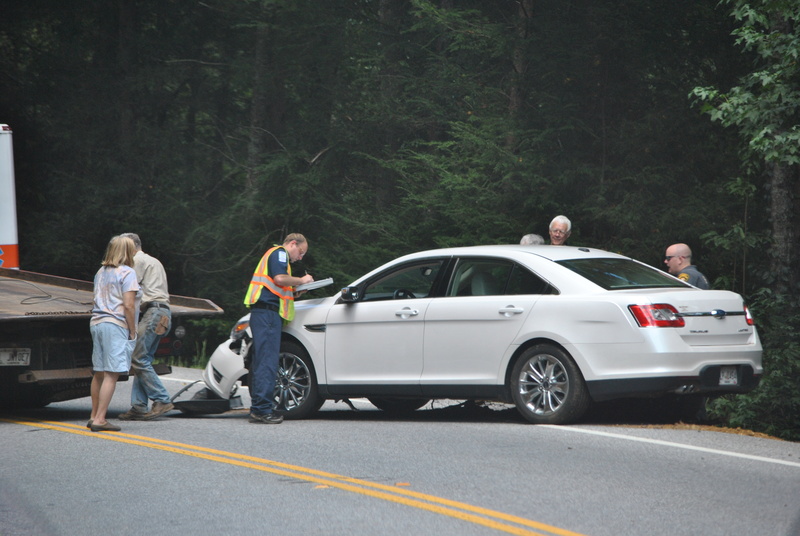 We do not believe the drive was seriously hurt in this one vehicle accident. It was a good reminder that these mountain roads can be hazardous. The roadway opened up after we were stopped for about 45 minutes. We were able to continue on to our next destination, Alexander’s. Their new website is not ready yet so I can only tell you this store is kinda like an outlet department store in less space and is located out in the country. We did not have time to go though the store to see what all is there so we are planning on making a second trip to Alexander’s later this week. 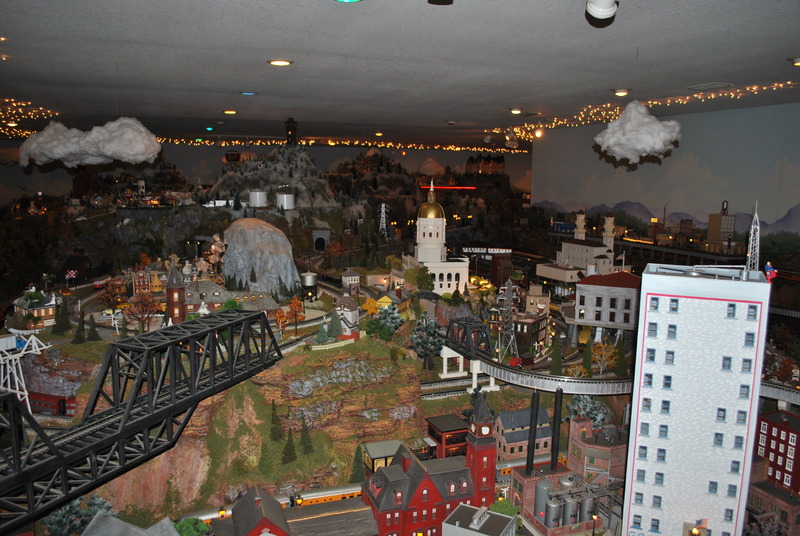 We also plan to visit the Misty Mountain Model Railroad Museum. 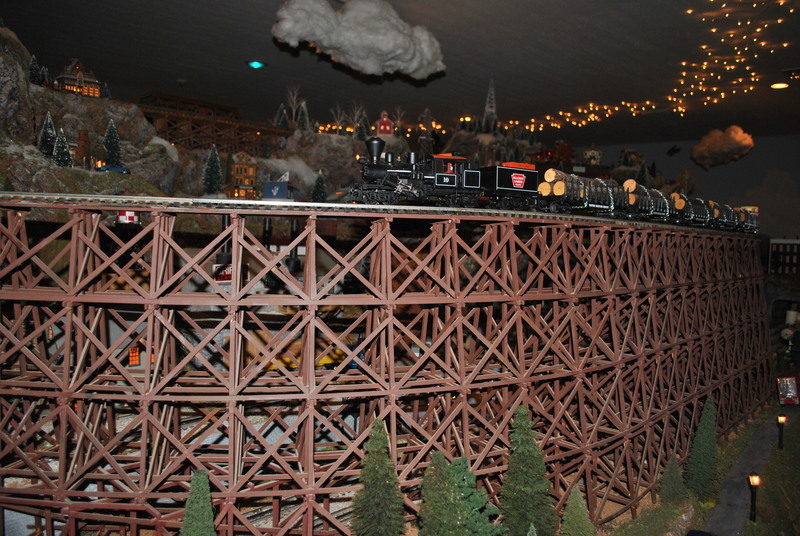 The owner describes it as “the largest privately owned O-guage train display in America: 14 trains travel on a mile of track thru southern Appalachian Mountains & North Georgia (scenery). That is it for our day trip to Cleveland, GA. Next weekend, we have visitors coming from Chattanooga. 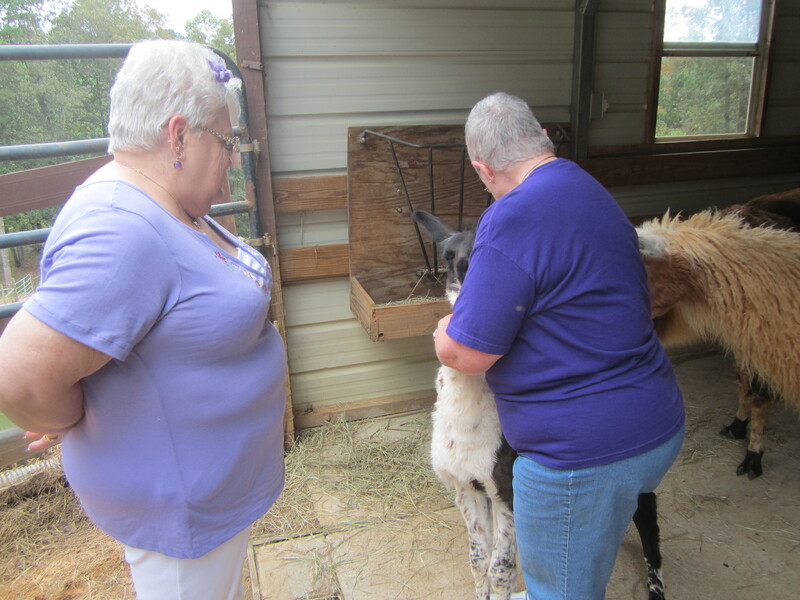 Bob and Carol have been following our blog for some time and wanted to come visit us and the llamas. We are excited to have them come so we can put face to names. Also, they said they would like to bring us some fresh hot Krispy Kreme doughnuts as a treat. 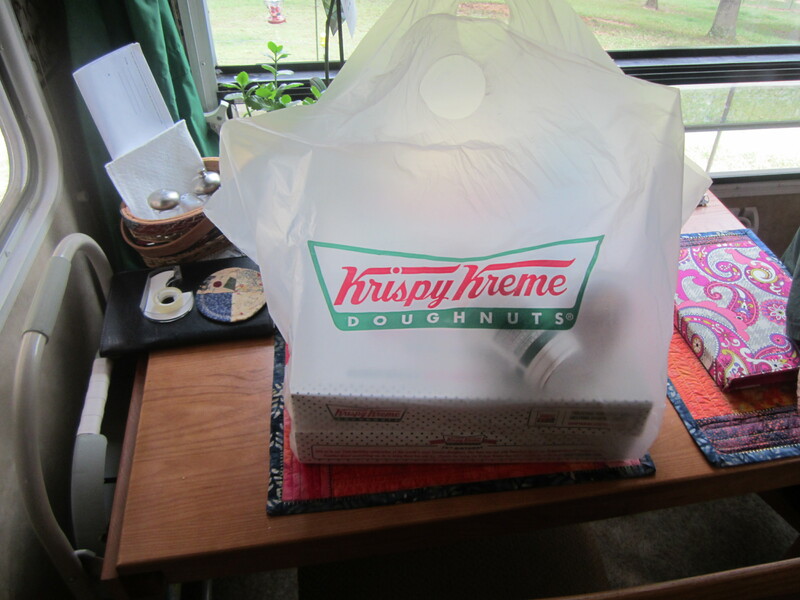 That will be a treat since I’ve not had a fresh doughnut since we left Corpus Christi. We look forward to their visit and treat. That depends on the number. This morning, I stepped on the scale like I do most Saturdays and I read the number. I got excited. The number on the scale read 279. For me that is a good thing. Six months of working on the llama farm has been good for me. Actually, retirement has been good for me. I’ve lost over 50 pounds since retiring. For me that is a good thing. For Blue Cross Blue Shield of Texas, they turned down my application for health insurance because I lost almost 40 pounds. Apparently they did not like the fact that I did that without my doctor’s OK.
Today that storage area has 42 bales of hay and now looks like this. Some of that hay was consumed and a bunch of it was moved to the boys barn. Here is a before and after photo of the boys barn. The boys barn normally has 16 bales of hay. Today it has 65 bales. I’ve been moving 10 bales per day. Next week, we will need to decide how much more hay will be moved to the boys barn. 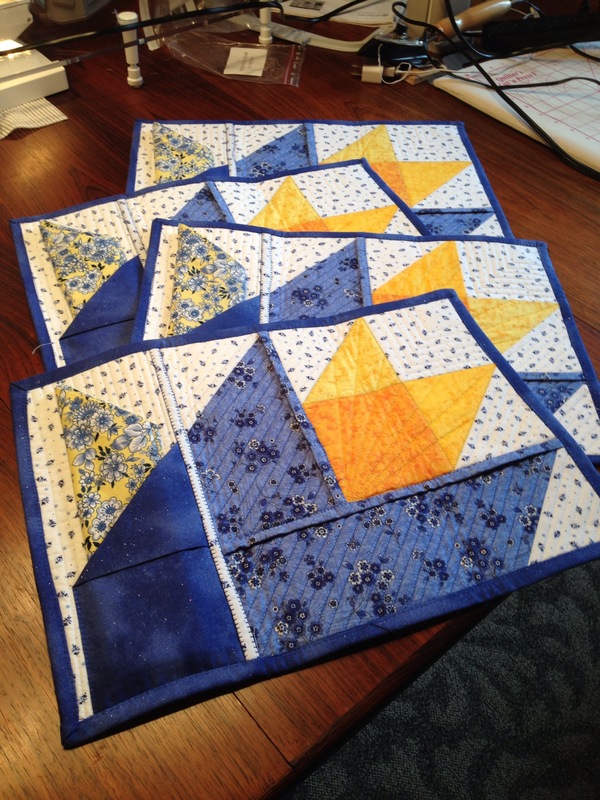 Remember Carol’s secret quilt project? Here is the finished project. She made 4 placemats for Pam and Jerry. The placemats have a cloth napkin holder and are reversible. I think she did pretty good. Well, that just about sums it up. We have 13 days left in Blue Ridge, Then once we head out, we have 1,147 miles to drive.